Something I’ve had a lot of trouble with over the years, and especially more recently, is over-committing myself and taking on way.too.many.things. I imagine you might have this challenge too. That’s because I know you have a big heart and you want to be involved and get involved with all of the amazing things happening in your community. And you have tons of ideas for what you want to do and create in the world. I’ve been going through a season of tough-love-learning and trying to get myself out of a status-quo that is above a healthy threshold. It’s not like people put themselves in these overcommitted situations on purpose or consciously. It’s a habit. A habit and not really knowing where that 100% threshold lies. It’s thinking that you can accomplish or take on more than is wise. And sometimes learning where that point is takes a little bit of trial and error. Unfortunately, as much as people might worry about the fact that you might be taking on too much, it doesn’t mean that you are going to listen until you hit that point of realization yourself. Unfortunately, this is how much our learning works, isn’t it? It’s great to take advice from other people and sometimes it helps a lot and you can avoid pitfalls. Other times you just need to do it yourself and then you find yourself realizing, “oh, yeah, that’s why people were recommending I didn’t take on this new project!”. Life adds up in terms of work responsibilities, family responsibilities, friendships, etc. And then there are the unexpected things that happen. Over the past 5 months, I experienced all of these pressures on top of a health challenge and it all got mixed up together and made it quite challenging to keep going. I (stubbornly) didn’t cut back as aggressively as I maybe should have, but I was forced to take a hard look all my commitments. I slammed on the brakes on a few things and made some hard decisions about what to keep and what to let go of. I had to figure out how to re-prioritize some time for myself for my health — mental health, physical health, emotional wellbeing — and relationships. It’s much more challenging to be faced with damage control than to prevent getting into the situation in the first place. So here are a few pieces of advice having just been through it. Hopefully, if it’s needed, some of this advice will resonate and allow you to make preventative adjustments in your own life! Listen up if your friends and family are sharing concerns about the fact that you might be taking on too much. As much as you think you can handle things, it’s probably time to pause an extra moment and consider where there might be truth in their advice. Even if you think you are not in that situation, make a note that maybe this is something you might want to think about. After all, when you’re right in thick of overwhelm you will be the last person to realize you’re in too deep. If you’re at that 200% commitment level, you don’t necessarily realize how over-committed you are until it hits a breaking point. That’s essentially what happened with me. I took on a lot. I thought I could do it all. I made a lot of promises and commitments and didn’t want to let anyone, or myself, down by changing the plan after it was set. It took a lot for me to realize how much of a toll it was taking on my wellbeing and my ability to sustainably create impact. All this is to say — if you have people giving you advice to take a breather and give yourself some space, it’s worth a listen. If you feel like you haven’t stepped back for a little while to take that 30,000-foot view of what you’re working on, your energy levels, and what your capacity really is, then it’s worth taking a break. If you’ve been working every day for many months (even if it’s only an hour on some days on the weekends) then it’s been too long since you’ve taken a solid break from work. If this is the case for you, it’s time to go on a little vacation, read something mindless, or even watch Netflix all day! I don’t care what you do. Just take a break and it will give you some perspective. 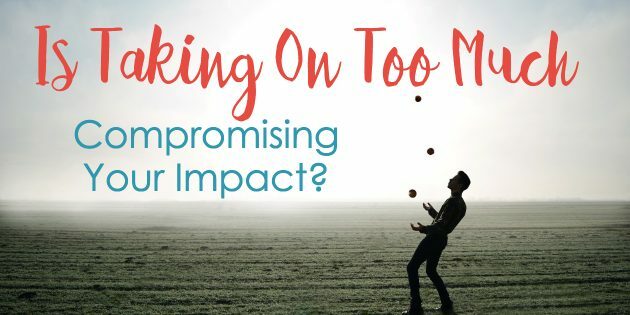 This break will give you perspective about where your TRUE capacity is and, if you’re paying attention, you’ll feel fairly quickly if you’re at a good level or over-doing-it. 3 – White Space, You Need It! If you step out and realize that you were in a busy period, but overall are still within your 100% capacity, that’s fantastic! Don’t let this be an invitation to add more in. It’s quite the opposite. You need some level of white space — not only for your own health, sanity and well being — but you need it for your work too. If you’re jam-packed at that 100% level on a consistent basis, then you’re not leaving any time for happy accidents and new ideas to bubble up to the surface. If you have no white space, you need to start moving towards a better equilibrium. The blind spot that got me into an overcommitted state was precisely the oversight of not building any white space into my plans. I could have kept going at the pace I set only if absolutely nothing went wrong in my life. But the reality is that several unexpected demands on my time showed up all at once, on top of an already overflowing schedule! Even if nothing major ends up throwing you off your pace, that white space is a beautiful thing to have for yourself. Plan for it. Build it in. ENJOY IT! If you’re reading this and nodding your head, thinking you might be overcommitted in your projects right now, pick one of the ideas in this post and just start moving towards it. You don’t need to fix everything today. You can’t necessarily shift your equilibrium overnight but every step towards more balance counts. You can be conscious of where you’re at now and where you ideally want to be. And then you can start to make some decisions to move towards that equilibrium. And when in doubt, give yourself more space and more extra room than you think you need. I say this because if you’re an overachiever like me, you probably underestimate how much time certain things take as well in your life. Please take this message to heart, take care of yourself, and I’ll talk to you again soon. This is really great advice for all entrepreneurs because of our overall tendency to over commit! Good for you for realizing you had taken on too much and I know your future direction is the right one. Thanks for your heartfelt and honest sharing of this difficult topic.